Below are the ADT Monitoring options you can choose from. The most popular are the ADT Command options right now. 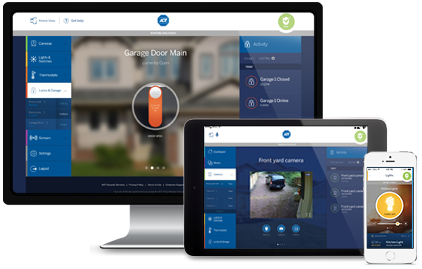 See why 8 million customers choose ADT monitored security. Get help when you need it from fast response monitoring agents through ADT’s interconnected command centers across North America. Monitoring professionals are dedicated to your safety, and taking care of the people and property you value most in your life. More than 8 million customers trust ADT to help monitor and protect those things that cannot be replaced, remade or rebuilt. It’s a trust the company has worked to earn and maintain every day for more than 140 years — and it will continue to earn your trust 24 hours a day, 365 days a year. Fill out the form below and a home security specialist will contact you as soon as possible. that require a landline, but these are the most popular. Go here for more monitoring options. you control your home from the palm of your hand. like and even tablets or computers. You can also set custom notifications to know when a door is opened or if there is motion or not motion. or when a child opens a cupboard. With two way voice the ADT Monitoring Station is able to talk and listen into the home to get an audio verification immediately. This audio verification can increase response times and reduce potential false alarm fees from the police department. You can have up to 8 wireless cameras added to your ADT Command system. These cameras can record 6000 30-second clips monthly when there is motion or another trigger. You can view live video to check on your home or business. There are indoor and outdoor cameras available. For more cameras you can add up to 8 expansions packs which adds 4 cameras per pack. 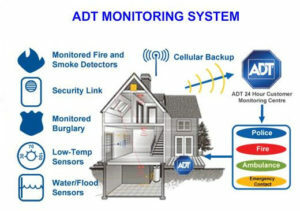 How Many Monitoring Stations Does ADT Have? 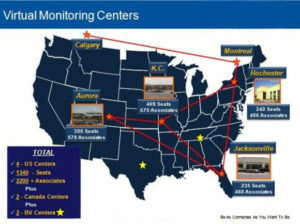 ADT has 6 monitoring stations located throughout North America and when your alarm goes off it goes to the least busy of these central stations. Furthermore, the monitoring rates are very reasonable, for more information on rates, see the chart above. If you are looking for ADT Pulse Monitoring costs, click here.